Spring has officially arrived in Chicago, at least on the calendar. The thermostat says otherwise -- it's not even 30 degrees as I write this. Authentic spring weather will be much appreciated once it arrives! 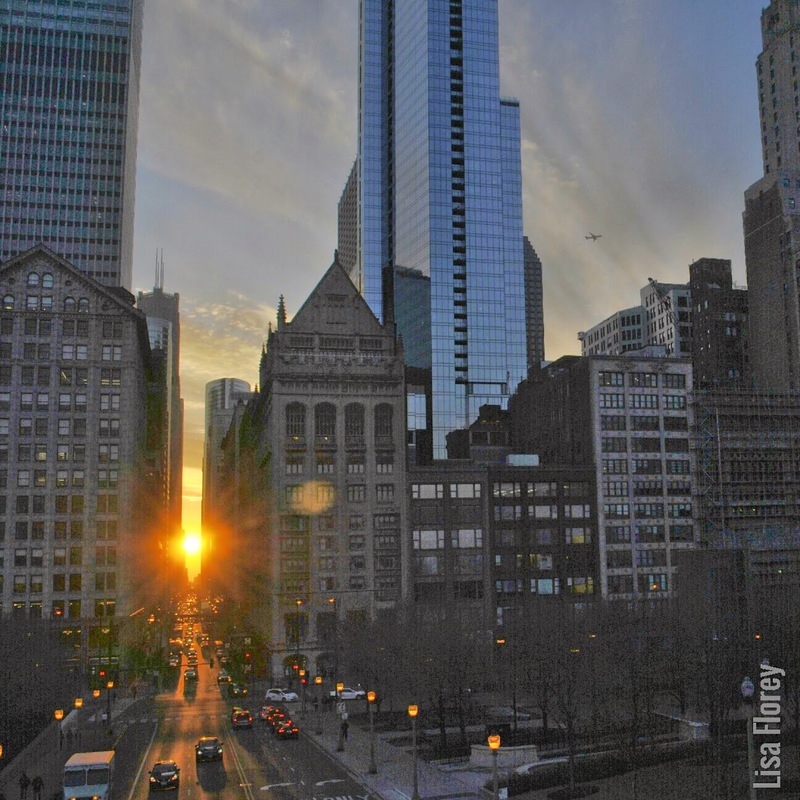 I went to Chicago March 20 to chase the sunlight as it set downtown. 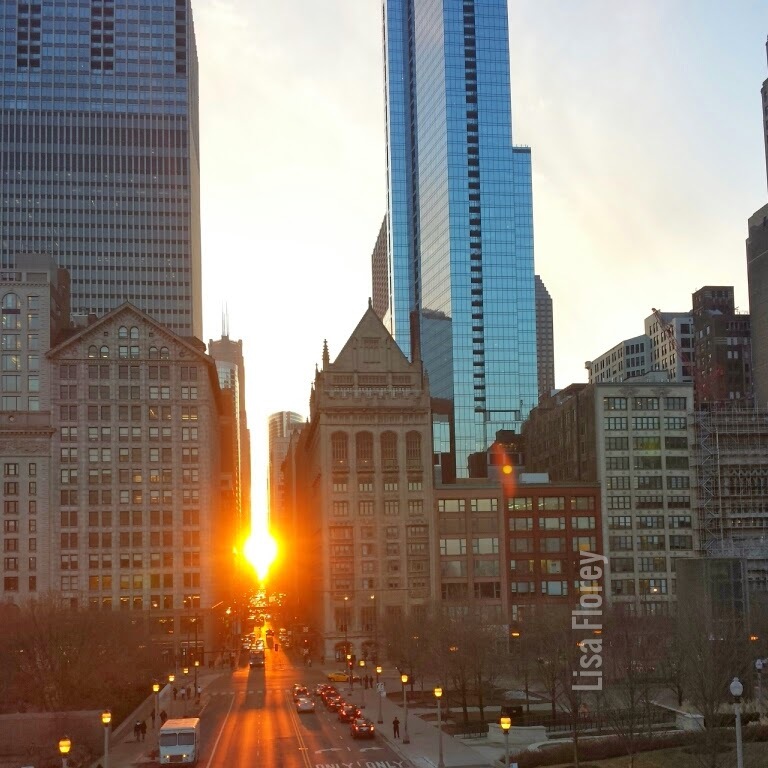 Thanks to this post by Nick Ulivieri (one of many talented photographers I follow on Instagram) I learned about Chicagohenge. 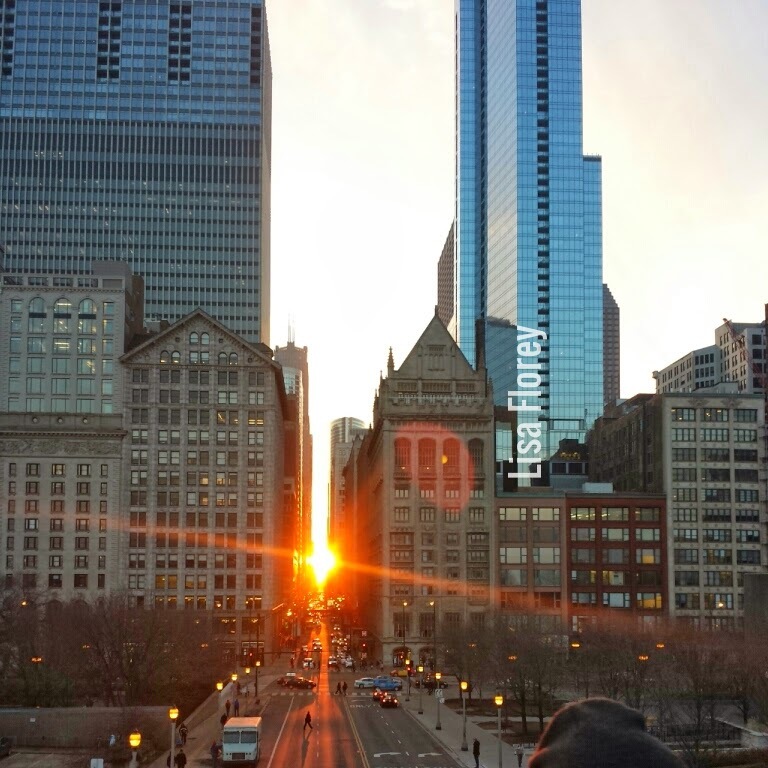 During the spring and summer equinoxes, if the weather cooperates, the sun will rise and set in near-perfect alignment with the "canyons" in the Chicago Loop. I couldn't miss that! I went downtown way too early in the afternoon and wandered around, visiting the Bean and popped into the Chicago Cultural Center, did some writing at a Corner Bakery, then went over to the Art Institute of Chicago. There's a pedestrian bridge that seems custom-made for photographers -- I've taken quite a few shots from that bridge. I got there way early, and was not the only one there waiting for the light to change. As it got later, more and more photographers congregated on the bridge. I'm sure anyone who saw us up there was wondering what the heck we were doing. It was pretty fun because I knew a few of the photographers from Instagram and 8x8 Gallery photowalks around Chicago. It's a big city but a small world. The sunset was really something to see -- the weather was perfect! I took some photos with my Galaxy S4 and more with my Nikon D3000. If you go on Instagram and search the tags #Chicagohenge and #urbancanyon_henge14, you'll find plenty more fabulous photos. Check out this Flipagram that shows the progression of the sunset. My favorite because of the sunbeams. Nevermind the top of someone's hat on the bottom right Taken with Galaxy S4. Alignment. The only way this would have been better? If there was a train on the El tracks and I had a zoom lens. And had the settings on the Nikon a little different. Taken with Nikon D3000. Another one I like because it has the flare, and because I got the plane in there, too. Not quite sure which camera this one is from, but I think the S4 because it's a bit grainy from zooming in.